New Delhi, Nov 6: Nagarkirtan, an urban love story of a transgender got national appeal, as it was selected for the 49th edition of the International Film Festival of India (IFFI). Directed by Kaushik Ganguly, the flick will share space with biggies like Padmaavat and Mahanati in the Panorama section of IFFI, scheduled to be held in Goa from November 20 to 28. The section features 26 different films with unique or original stories, including 22 feature and four non-feature films. Talking about the flick, Producer Joy B Ganguly said Nagarkirtan is a simple movie, which explores the story of Piramal or Puti, who is born a boy, but eventually understands that he is a woman trapped in the body of a man. The social dilemma worsens as Puti falls in love with a flute player, Madhu. The film is not only about Puti’s fate, but also about the couple’s journey through devotion to eternal love. The heart-wrenching story has won four awards in the regional film category at the National Films Awards 2018-19. The flick then went on to win the heart of the critics, making it the first for any Indian filmmaker to win an award at the Toronto Film Critics Association. It is an urban love story of a transgender that frames the experience of an invisible community, which is rarely portrayed in the arena of Indian mainstream cinema, said Mr Ganguly. 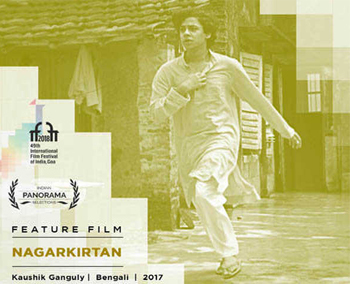 Nagarkiran is the ninth consecutive nomination for the Director, who has come a long way after he made his last film, ‘Just another Love Story – ArektiPremerGolpo’. 'I am truly honoured and excited! The celebration of the Freedom of Love will make this year's IFFI more colourful for sure,' he added in a statement here. The film is currently doing rounds at film festivals and is expected to release in India, early next year.